This is not a rare scenery, right? Because of its good reputation, the SanDisk SD card has become the first choice for majority camera and mobile phone users to save significant photos, videos and other files. However, the SanDisk SD card is not so secure as you think. You may lose your photos from the card for various reasons. But no worry. Read on, and this passage will introduce a free but powerful SanDisk photo recovery solution to help you rescue the deleted photos. What Causes You to Lose Data from SanDisk SD Card? Before we talk about how to recover lost photos from SanDisk SD card, you should figure out why your photos are deleted so as to avoid this accident from occurring repeatedly. In addition to accidental deletion, here are 4 main reasons that can lead to the photo loss in SD card. If you suddenly disconnect the SD card when transferring data or force to pull out the SD card while your device is on, there is a great possibility that your data on SD card will be deleted. Sometimes you can format the SD card by accident, and sometimes the system will request you to do so when access your SD card. As a result, you will lose all of the data. If your SD card get damaged, such as being dropped into water, the data on it are likely to be erased. When you connect your SD card to a device with virus, your SD card will also be attacked and you will suffer data loss. So do not use it on any risky devices. Can you Recover Lost Data form SanDisk SD Card? Since the lost data will become totally invisible after being deleted, is there really any chance to recover deleted photos from SanDisk SD card? Yes! Although you can not view and access the deleted photos after deletion, the system will continue to keep them on your SD card until they are overwritten by new file. So do not store any new data into the SD card after you lose photos from it. How to Recover Deleted Photos from SanDisk SD Card for Free? To recover the deleted photos, choosing a reliable SanDisk photo recovery software is vital. Here Jihosoft Photo Recovery is highly recommended. 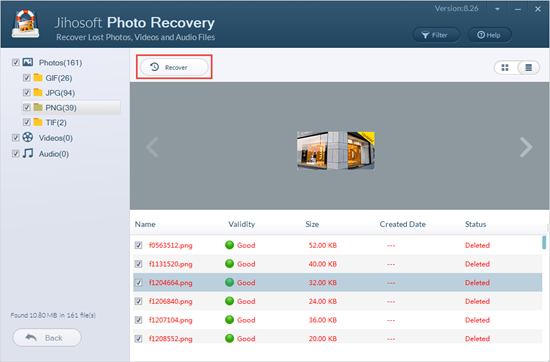 It is one of the best photo recovery programs for Windows/Mac, and supports to recover various types of image from diverse storage media with three simple steps. Step 1: Select the SanDisk SD card from which you would like to recover photos. Connect your SD card to computer and launch Jihosoft Photo Recovery. Then you will see all of your disks in a list. Select the SanDisk SD card from them. Step 2: Scan your SD card for deleted photos. The “Advanced Settings” allows you to scan for assigned types of photos, which will shorten the scanning time. Or you can just tap on “Scan” to scan for all the photos. 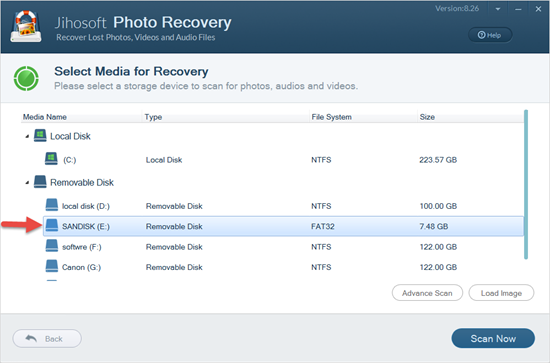 Step 3: Recover photos from SanDisk SD card. 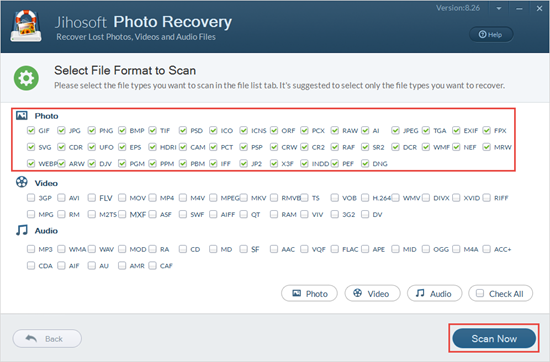 When the scan is finished, you will see all the recoverable photos listed out by category. Preview them one by one, check those you want and click “Recover”.